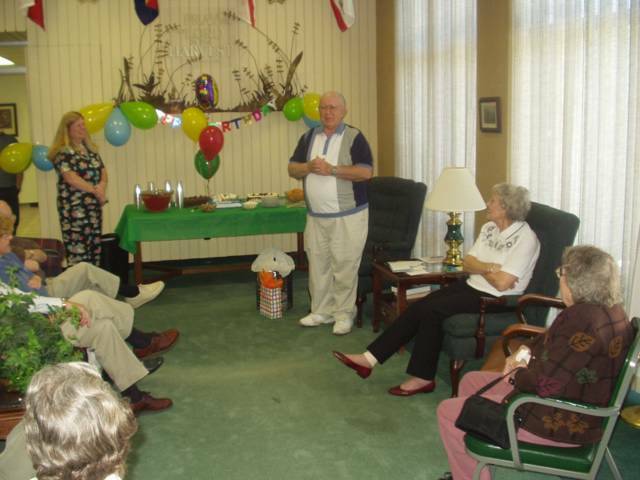 Pastor Charles Ashman (standing, right) was honored Tuesday morning, June 1, 2004 for reaching his 80th birthday. Several dozen friends and Grace Brethren national organization staff people gathered in the lobby of the GBNAM building. Ashman’s wife, Frances, is seated at right (white blouse). Sandy Barrett of the FGBC Coordinator’s office (standing, at left) helped coordinate refreshments and arrangements for the surprise event.